Starting a blog can be a great idea for a variety of reasons. Perhaps you wish to promote your business, discuss your hobbies and interests, retell your life experiences, or just get your thoughts out there. Blogging is also a great way to connect with a wider community of bloggers and build useful relationships. There’s also the potential to make money by blogging! Discuss interests. Write something interesting about one of your hobbies or other interests. In addition to content, consider your audience. Some people start blogs primarily for themselves—they just want a place to write their thoughts down. However, many others would like to reach a wide audience with their content. If you fall into the latter, you should consider your target audience and be sure that the content you produce is engaging to at least some portion of the population. We’ll talk about promoting your blog later, but at this point you should be thinking about what should be the purpose of your blog. Consider using your own name, especially for personal blogs. Draw inspiration by looking at popular blogs on the internet and blogs that produce similar content to yours. Choose a blog name that has a corresponding domain name available so you can effectively host your website. You can consider using a domain name generator such as Lean Domain Search for some inspiration. This is made with domains in mind, but it should be fairly applicable to generating names for blogs. It is very difficult to publish content online by yourself without using a content management platform. Member.buzz is one such platform that allows you to create a space to publish content for free and to design a great looking website. Member.buzz offers free subdomains, but you can also purchase a custom domain using GoDaddy. You can learn more about registering custom domains here (link to article on domains). Member.buzz also offers additional features such as an events module that can be valuable for some blogs. Here is a brief guide to starting out with Member.buzz. 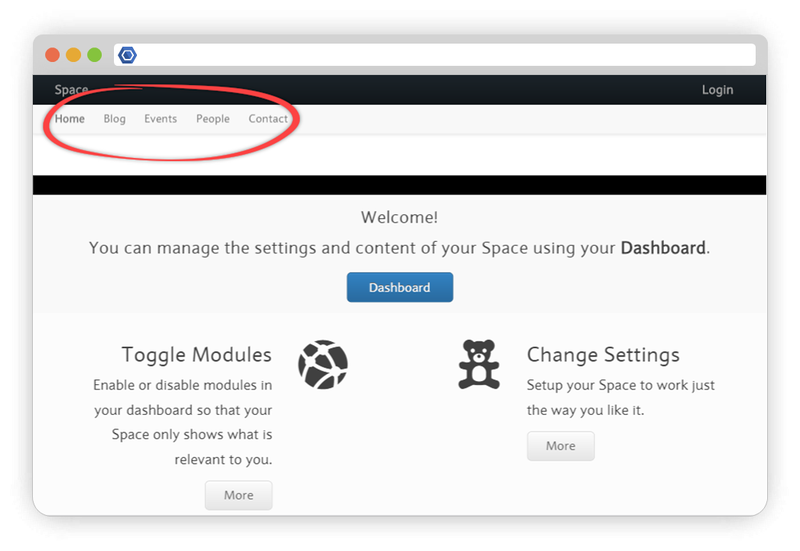 To get started, create a site by going to “Create Space” at the top right corner of the page, as shown below. When you register, you will be prompted to choose a free subdomain, but you can add a custom domain to your site later. 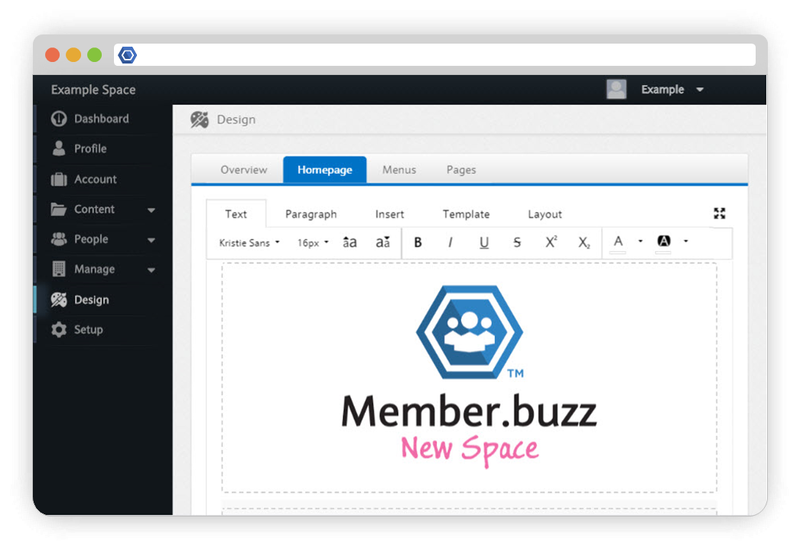 Member.buzz offers a powerful design platform containing a wide arrangement of tools to make your site look amazing. First, begin by going to “Design” after navigating to your site’s Dashboard, as shown below. By default, new sites also have a button linking to the Dashboard on their homepage. 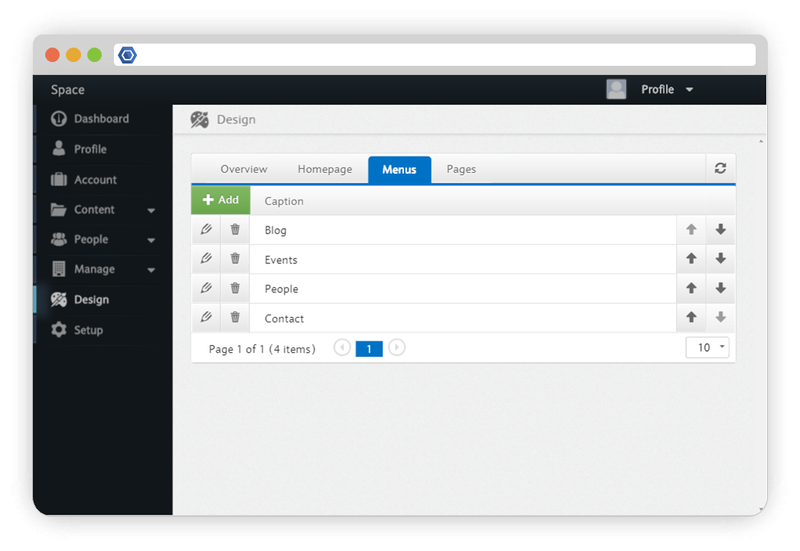 You can use the Dashboard to modify your homepage and create additional pages for your site. 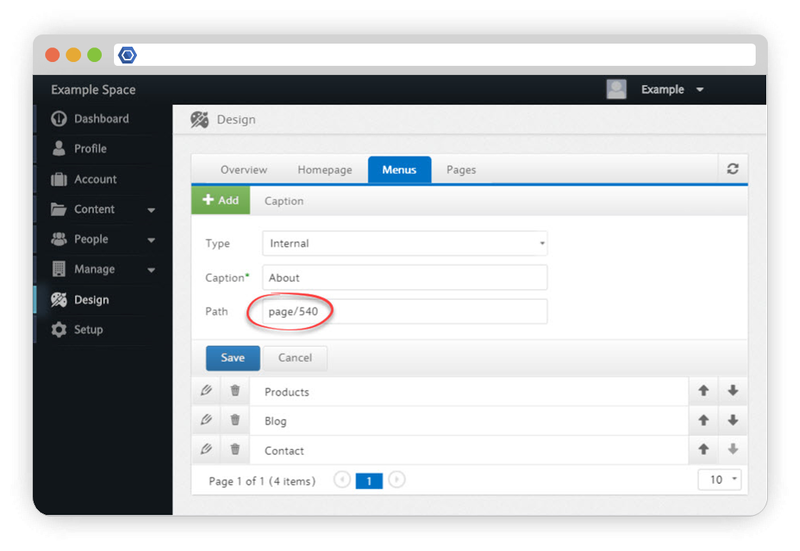 To create pages, go to the Design section of the Dashboard and then select “Pages”. You can then populate your page with text, images, videos, and other content. The Designer uses “slices” to arrange the layout of the page. 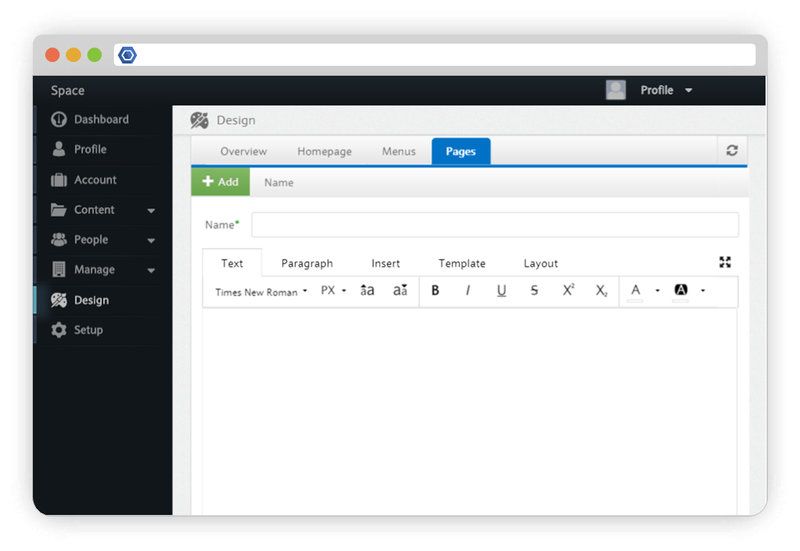 You can insert and modify slices manually to customize your page, or you can select from a variety of layout templates for quick page design. The designer also uses standard word processor functionality to customize the text of the page, allowing for easy text design. Once you have created pages, they are saved to that section of the Dashboard. 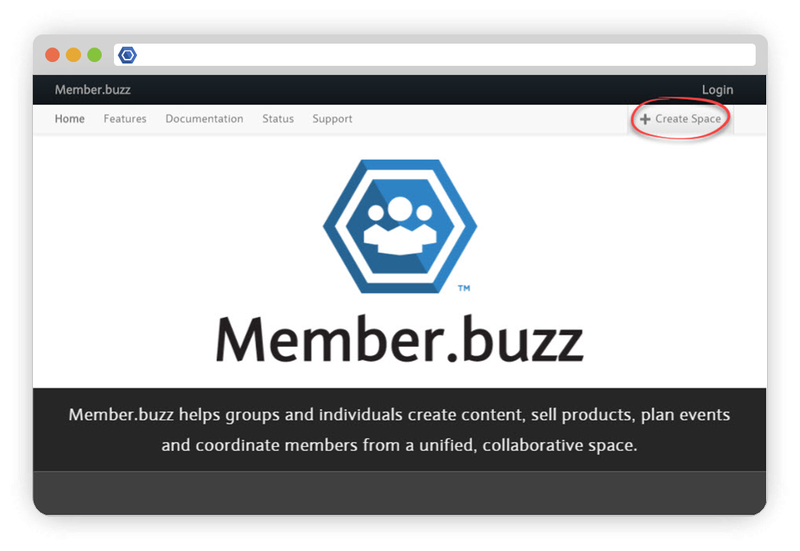 To learn more about how to design Member.buzz pages, check out the Member.buzz support documentation. Menus appear at the top of your Member.buzz homepage and can link to other parts of your Member.buzz site (or to external sites). 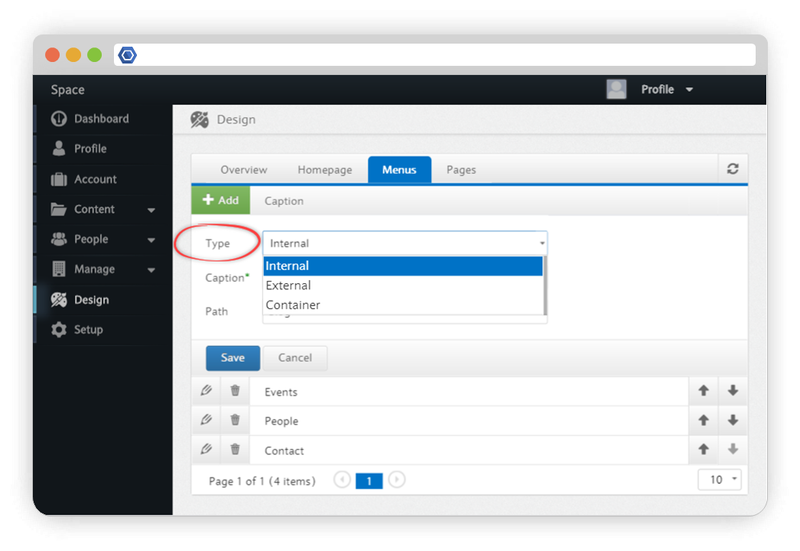 To create a menu, select “Menus” in the Design section of the Dashboard. You can then select which type of menu you want. These menus link to another part of your Member.buzz space. These menus link to external sites not on the Member.buzz domain. These menus do not contain active external or internal links, but still appear on your homepage. If you are creating an internal menu, you will then enter which path your link will make–this will be what appears on the destination URL after your homepage's domain. If you are creating an external menu, you can then simply enter the address of your menu's destination. The caption will be what appears at the top of your homepage. When you create a page, you can then use the extension on the domain after your space name and insert it under "path", linking the menu to the page. You can also link to pages not on the Member.buzz domain by selecting an external menu. In addition to menus, there are other ways to insert links throughout your site. For example, buttons provide another clean way of providing links to other parts of your Member.buzz site or to external sites. You can insert a button using the icon in the "Insert" tab in the designer. You can add a link to the button by clicking he icon, also located within the "Insert" tab. Your homepage is the first page that visitors will see when navigating to your site and as such it’s particularly important to have a well-designed homepage. By default, your Member.buzz homepage will already haven some content, as shown below, but you can delete or change any of this using the designer. You can design your homepage by going to “Homepage” in the “Design” section of your Dashboard. If you encounter any difficulties using Member.buzz or if you wish to learn more about its features, you can go to the support documentation or submit a request via the support site. Create quality content. In order to build a dedicated following, you must publish content that people enjoy reading. Have a custom domain. These look more professional and are more likely to be found via a Google search than subdomains. It’s also fairly inexpensive. You can see our guide here (insert link to guide) on choosing and registering a domain. Have a well-designed blog. Be sure that you have a quality blog layout and include aesthetically pleasing pictures when relevant. Share widely. Especially in the initial stages, you’re going to want to tell friends and family that you’ve started a blog. You’ll probably also want to share blog posts on Facebook, Twitter, Instagram, Linkedin, Reddit, and other social media platforms. You can do this on your own personal account to start, but you’ll also probably want to create some social media profiles for your blog itself. Share and credit other people’s content on your blog. This can help you build relationships with other bloggers and direct their audiences to your blog. Engage with your audience. Once you’ve built a small audience, be sure to communicate with your audience by responding to comments and emails. You could also offer to take requests in order to keep your audience engage. Write frequently. Blogs that publish frequently (at least once per week) are much more likely to build a dedicated following than those that rarely publish content. Keep in mind that it can take a while for your blog to develop a large following. Promoting your blog also takes a lot of work, so if you’re serious about having a large following, be prepared to work hard for a long time. Advertising. This is the most common way of monetizing your blog. It’s also how many of the largest internet companies such as Google and Facebook generate their revenue. You can start advertising on your blog by using a network like Google AdSense. Promoting a business. Many blogs are started with the primary purpose of promoting a business and many companies large and small have blogs that highlight important news and information. Affiliate income. You can build partnerships with companies whereby you link products and receive commission on product sales. To learn more about popular affiliate programs, check out this list assembled by ProBlogger. Product & service sales. You can sell merchandise directly on your blog. Bloggers can also offer services such as consulting, training, or editing to their audience. Events. Some blogs host events such as workshops, trainings, and social meetups. Member.buzz is a great platform for this because it supports membership, events, and ticket sales. Donations. If your blog has a loyal following, you can ask your audience for voluntary donations. You can always add a donation button directly to your blog, or you can set up a Patreon account, which allows you to collect monthly donations from people and offer a variety of perks to donors.